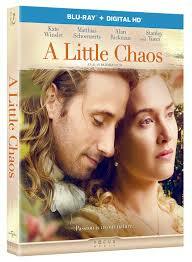 The costume drama-romance A Little Chaos reunites Alan Rickman (Harry Potter and the Deathly Hallows Part 2) and Kate Winslet (Carnage) for the first time since 1995’s Sense and Sensibility. In Chaos, Rickman (who also directs) plays Louis XIV of France, otherwise known as the Sun King. Winslet is Sabine de Barra, a landscape architect hired to design an outdoor ballroom in the gardens of the newly built palace at Versailles. In one scene, craving a bit of elusive solitude, the King doffs his wig and coat and takes a solo turn about the nursery of one of the gardeners who stocks Versailles. Winslet’s Sabine, mistaking the King for the gardener, engages him in a perfectly ordinary conversation about pear trees, the weather, and other innocuous topics. Rickman’s acting in this scene is nuanced and compelling. He allows his face to tell the story of the exquisite relief felt by a monarch having what may well be the first and only pedestrian conversation—one not burdened by the weight of his own rank—in his entire life. It’s a charming scene, one that makes you wish Winslet and Rickman had done more scenes and more movies together over the past 20 years. But alas, it’s one of the few significant charms in an otherwise slight movie that offers some pretty pictures of gardens, some fine acting, and not much else. Rounding out the central cast is Matthias Schoenaerts (Rust and Bone) as Andre Le Notre, the King’s own landscape architect who initially hires Sabine and oversees her work. Sabine has lost her husband and only child in a tragic accident, and Andre is trapped in a marriage that has long since turned loveless and stale. As the rules of such films dictate, the two start out as ideological opposites who can’t help rubbing each other the wrong way, but who eventually fall into each other’s arms and beds. There’s a pretty heavy-handed metaphor here about two gardeners who bring life to the earth, but who themselves have lain fallow and emotionally barren until they find—and tease shoots of life out of—each other. The heavy-handedness wouldn’t grate if there were more substance to the movie as a whole. But it never quite gels or adds up to more than the sum of its parts, and the chemistry Winslet has with Rickman in that one brief scene is so much stronger than her chemistry with Schoenaerts over the entire movie that it’s difficult for anything to grow in its shadow. Stanley Tucci (Some Velvet Morning) is enjoyable in the secondary role of the King’s foppish and effeminate brother (it’s fortunate that he plays such roles well, as they seem to be all anybody’s asking him to do these days), and Helen McCrory (Hugo) is watchable as always in the role of Andre’s prickly, unfaithful wife. Jennifer Ehle (Contagion) is strong enough in the role of the King’s mistress that one wishes she’d been afforded more screen time. All in all, A Little Chaos goes down pleasantly enough, even if it never ascends to any great heights. If you’re looking for a way to experience the outdoors on a rainy afternoon, you could certainly do worse.